BACKGROUND AND PURPOSE: Little information is available regarding the anatomy of the intracranial veins and sinuses that can be shown on MR venograms of children. The aim of this study was to determine the normal venous anatomy and anatomic variants. METHODS: Fifty children who were referred for investigation of developmental delay and who had normal results of MR imaging of the brain were recruited into the study. The cerebral veins and sinuses, including the occipital sinuses, were assessed by using 2D time-of-flight venography. Particular attention was paid to the anatomy of the venous confluence. RESULTS: Twenty-seven cases had dominant right transverse sinuses, 18 had dominant left transverse sinuses, four had co-dominant transverse sinuses, and one had absence of both transverse sinuses. In 21 (51%) of 41 cases without occipital sinuses, absent or hypoplastic transverse sinuses were found. Nine patients had occipital sinuses. Five (56%) of nine patients with occipital sinuses were younger than 2 years, and patients younger than 2 years accounted for 24% of all patients (12 of 50 patients) in the study. In six (67%) of nine patients with occipital sinuses, absent or hypoplastic transverse sinuses were shown. Two patients had bulbous prominence of the vein of Galen. One had foreshortened superior sagittal sinus, which in turn is drained by two paramedian cortical veins. CONCLUSION: Understanding the normal anatomy of the cerebral venous system and its variants by using MR venography in children provided the background to future studies on anomalous venous structure in malformations of the brain. Intracranial sinus and venous anatomy may be visualized by several methods, including conventional angiography, MR venography, and CT venography. MR venography has several advantages over conventional angiography and CT venography in children, based on the radiation dose associated with CT and conventional angiography and invasiveness of conventional angiography. MR venography is therefore being used increasingly to study the intracranial venous system in children. Previous MR venography studies have been performed mainly in adults (1–3), and little information is available regarding the sinus and venous anatomy that can be shown on MR venography in children. The aim of this study was to contribute to the understanding of the capability and limitations of MR venography in children. Major ethical limitations are involved in the study of normal children by using MR imaging. Therefore, 50 children who were referred for investigation of developmental delay but who had no history of epilepsy or focal neurologic signs were included in this study. The age range was 3 months to 17 years (median age, 5 years), and the results of their clinical MR imaging examinations had been reported as normal. Patients with any brain abnormality were excluded from this study. All MR imaging examinations were performed on 1.5-T superconducting systems (Eclipse or Infinion; Philips Medical Systems, Cleveland, OH). Routine MR imaging consisted of axial and coronal fast spin-echo T2-weighted imaging (3000/100 [TR/TE]; field of view, 24 cm; section thickness, 5.0 mm; matrix, 352 × 512) and axial and sagittal spin-echo T1-weighted imaging (493/14 or 16; field of view, 23 cm; section thickness, 4.0 mm; matrix, 256 × 256). MR venography was performed by using a 2D time-of-flight method with an inferior saturation band to eliminate signal intensity from arterial structures. The parameters included 30/7; flip angle, 30 degrees; section thickness, 2 mm; matrix, 256 × 256; and field of view, 20 cm. Maximum intensity projections were constructed from the source images and were reviewed along with the source data. Imaging findings of the following veins and sinuses were recorded: internal cerebral veins, basal vein of Rosenthal, vein of Galen, straight sinus, vein of Trolard, vein of Labbé, superior sagittal sinus, occipital sinuses, transverse and sigmoid sinuses, and internal jugular veins. Any anatomic variant was recorded. The calibers of the transverse sinuses (1 cm from the torcular herophili) were compared with the size of the superior sagittal sinus (also measured 1 cm from the torcular herophili). The sigmoid sinuses also were measured 1 cm from the junction of transverse and sigmoid sinuses and the size compared relative to the superior sagittal sinus. The internal jugular veins were measured just below the jugular bulb. In cases in which the linear dimension of the transverse sinus was less than half the diameter of the superior sagittal sinus, those transverse sinuses were defined as hypoplastic. If that structure could not be identified at all, it was described as aplastic. The dominance of the transverse sinus was assessed. Statistical analysis comparing the age group and transverse sinuses of those patients with occipital sinuses and those without was conducted by using χ2 analysis. Spearman’s correlation was assessed between the age of the patients and the size of the occipital sinuses. The visualizations of the intracranial veins and sinuses are presented in Tables 1 and 2. Patterns of drainage of the straight sinus and the superior sagittal sinuses are shown in Table 3. In 27 (54%) of 50 patients, dominant right transverse sinuses were found; in 18 (36%) of 50, dominant left transverse sinuses were found (Fig 1). In four patients, the transverse sinuses were co-dominant; one patient had absence of both transverse sinuses. Two patients had bulbous prominence of the vein of Galen (Fig 2). Variations of the superior sagittal sinus included a high splitting superior sagittal sinus in each of two patients and a foreshortened superior sagittal sinus, which is drained by two prominent cortical veins anteriorly in one patient. MR venography of the cerebral sinuses and its variations in the torcular herophili. A, Right and left transverse sinuses are of similar caliber. Both the superior sagittal and straight sinuses drain into the torcular herophili. B, Flow void is seen in left transverse sinus. The superior sagittal and straight sinuses drain into the right transverse sinus. C, Right transverse sinus is absent. The right sigmoid sinus and internal jugular vein are atretic. The superior sagittal and straight sinuses drain into the left transverse sinus and then into the sigmoid sinus and left internal jugular vein. Venous plexus are seen around the foramen magnum. Selective 2-cm midline band is applied to the maximum intensity projection of the MR venography to exclude cortical veins. Lateral projection of the maximum intensity projection image shows the bulbous prominence of the vein of Galen (arrow). In 41 (82%) of 50 patients, the occipital sinus was not seen. In nine (18%) of 50 patients with occipital sinuses, five were bilateral and four were unilateral (Fig 3). Fifty-six percent (five of nine patients) with occipital sinuses were younger than 2 years; however, patients younger than 2 years accounted for only 24% of all cases (12 of 50 cases) in the study (Table 4). The difference in age between those with occipital sinus and those without was statistically significant (P = .01). Size of the occipital sinuses did not seem to correlate with patient age (P > .05). The occipital sinus was not seen in children older than 9 years. Six (67%) of nine of those patients with occipital sinuses had absent or hypoplastic transverse sinus, whereas three had normal caliber transverse sinuses (Table 5). One patient had unilateral hypoplastic sigmoid sinus. Eighteen (44%) of 41 of those without occipital sinus had hypoplasia of one transverse sinus, and three (7%) of 41 had absence of the nondominant transverse sinuses. More cases of hypoplastic or absent transverse sinus were present in those with occipital sinuses (67%) than in those without occipital sinuses (51%) (P = .03). MR venograms of the torcular herophili associated with occipital sinuses. A, Occipital sinuses (arrows) are present on both sides, which serve as alternative drainage pathways from torcular herophili to internal jugular veins. This is associated with absence of both transverse and sigmoid sinuses. B, Right occipital sinus (arrow) is associated with atretic right transverse sinus. Increased sensitivity of MR imaging of the brain has led to increased use of MR imaging to detect and assess malformations of the brain. Congenital malformations of the brain, including midline cerebral anomalies such as holoprosencephaly and posterior fossa anomalies, often are associated with venous anomalies (4–7). The venous system has been imaged with conventional angiography, but MR venography has increasingly been used to study the cerebral venous system. MR venography is noninvasive, does not involve ionizing radiation, and can be performed at the same time as MR imaging in comparatively short acquisition times. An understanding of the normal anatomy of the venous structure and its variations and the development of the venous system is crucial before studying the abnormal venous structure in malformations of the brain. 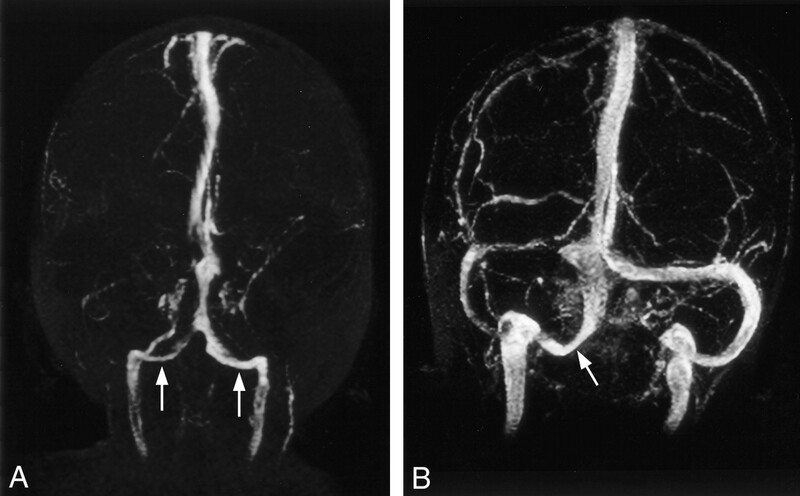 Considerable data are available from conventional angiography studies regarding the intracranial veins and sinuses, but data regarding the capacity of MR venography in children are scarce. In the third gestational month, the primitive internal cerebral vein receives the large superior choroidal vein (8). The medial cerebral vein drains the anteromedial portion of the primitive cerebral hemisphere and runs backward to open into the anterior portion of the internal cerebral vein of the same side. The two internal cerebral veins unite to form the great cerebral vein of Galen. The vein of Galen has not properly developed at the fourth gestational month, and the confluence of the internal cerebral vein, posterior thalamic veins, and basal veins unite to form the straight sinus (5). In the third and fourth gestational months, blood from the diencephalon and the basal ganglia drains through the lateral drainage route, that is, via the ventral diencephalic veins and middle cerebral veins into the tentorial sinus, which then drains into the transverse sinus (9). After this period, blood from the diencephalon and basal ganglia drains through the galenic system into the straight sinus. The maturation of the galenic venous system requires normal development of the diencephalon, the roof of the third ventricle being embedded in the interhemispheric fissure (4), and normal fusion and development of the tentorium (5). With the development of the splenium of the corpus callosum in the sixth fetal month, the vein of Galen has an adult type of configuration (10). The internal cerebral vein, vein of Galen, and straight sinus take a relatively straight course at the third gestational month (5). As the cerebral hemispheres enlarge, the straight sinus is displaced and flattened downward (10). The caliber of the straight sinus increases in the sixth gestational month, and the course of the straight sinus declines with descent of the torcular portion (5). During the fifth gestational month, an accessory straight sinus, also known as falcine sinus, appears temporarily in the falx cerebri just above the proper straight sinus and connects between the vein of Galen and the superior sagittal sinus (5). In two of our patients, bulbous prominence of the vein of Galen was present in the absence of a fistula. This bulbous prominence may represent remnants of the falcine sinus. 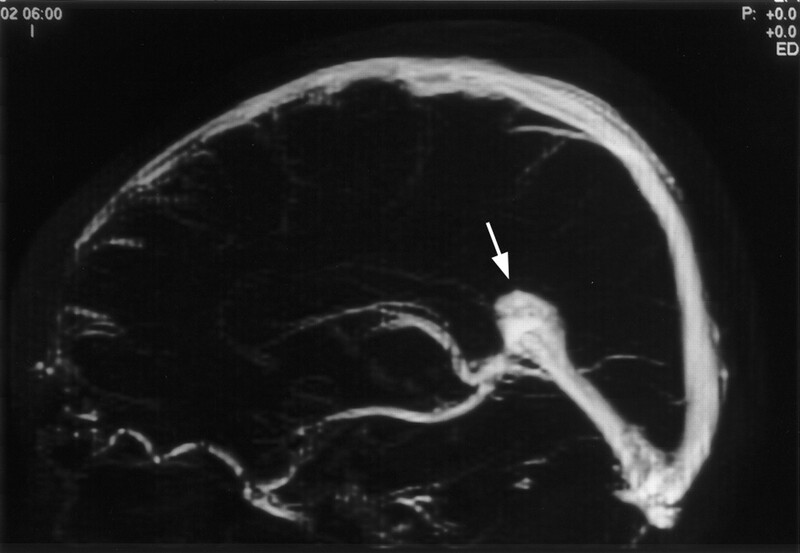 It is important to recognize that bulbous prominence of the vein of Galen in the absence of a fistula is clearly a normal variant in an asymptomatic patient, because this may be mistaken as an aneurysm of the vein of Galen. During embryonic development, the superior sagittal sinus is formed from the marginal sinus of each side, which becomes approximated toward the midline to form the superior sagittal plexus (11). This marginal sinus should not be mistaken as the marginal sinus at the foramen magnum. Posteriorly, the superior sagittal sinus may remain separated into the two limbs that drain laterally to join the transverse sinus of each side. The two limbs usually join to form the torcular herophili during the sixth fetal month. Failure to fuse anteriorly may result in the formation of a single pial cortical vein, each side running posteriorly on the superior aspect of the frontal gyrus in the parasagittal plane, approximately 1 to 3 cm from the midline. The frontal cortical veins open into the superior sagittal sinus behind the coronal suture. This anatomic variant was observed in one of our cases. Posteriorly, there may be connecting vascular channels or networks between the two limbs of the not yet fused superior sagittal sinus, which in later life produce many variations of the torcular herophili and adjacent dural sinuses. The transverse sinuses enlarge from their lateral border on each side from around the age of 4 months. This enlargement rapidly progresses medially and reaches the torcular herophili. As the volume of the telencephalon increases, the area where the straight sinus joins the superior sagittal sinus gradually descends. As a result, the inferior inclination of the lateral portion of the transverse sinuses is less marked as the fetus develops (12). The transverse sinuses continue to enlarge until they regain a relatively even caliber in the sixth fetal month. During the period of transition from the stage of plexiform networks to that of the rapid increase and then decreased in caliber, the dural sinus in the region of the torcular herophili and of the lateral sinus may in some cases become irregular. The medial and lateral portion of the transverse sinus may even be absent. The lateral sinus may be markedly hypoplastic or may even be absent in its major portion. Unequal heights, asymmetrical sizes, mild to marked irregularities, or even absence of the medial portion of the transverse sinuses are therefore frequently encountered (12). Less commonly, the lateral portion of the transverse or sigmoid sinus may also be hypoplastic or absent. In our study, absence or flow gaps seen in the three cases occur in the nondominant transverse sinus. This absence or flow void could occur during development of the transverse sinus. Absence of the medial portion or flow gaps seen in nondominant transverse sinuses could be a limitation of 2D time-of-flight MR venography. In a study by Ayanzen et al (13), thirty-one percent of their patient population had flow gaps in the transverse sinus, 90% of which were in the nondominant sinus. These flow gaps are not seen on conventional angiograms, and these artifacts arise as a result of various factors, including slow intravascular blood flow, in-plane flow, and complex blood flow patterns. Although 2D time-of-flight imaging is sensitive to slow flow, it nevertheless has a minimum threshold below which sufficient signal intensity from flowing blood cannot be obtained. To overcome the limitations of slow flow, the section thickness should be set as small as possible (13). Inflow enhancement is poorest when the plane is parallel to the vessel of interest, resulting in saturation of the in-plane flowing blood (1). To overcome artifactual signal intensity loss resulting from in-plane vascular flow, it is desirable to orient the acquisition plane perpendicular to the long axis of the vessel being imaged (13). Because the bulk of the intracranial venous flow is in an anteroposterior direction, toward the torcular herophili, section acquisitions in the coronal plane satisfy the requirement of perpendicular orientation during acquisition for most of the intracranial dural sinuses. However, signal intensity loss can be a problem in the region of the torcular herophili and posterior aspect of the superior sagittal and transverse sinuses, as these segments gradually become coplanar with the imaging plane. Such flow voids should not be mistaken for venous sinus thrombosis. The occipital sinus originates from fine plexiform vascular channels originating from the primitive torcular plexus. The occipital and marginal sinuses have been observed as early as the third gestational month (12). The occipital sinuses rapidly increase in caliber and exhibit the greatest development at the age of 4 to 5 gestational months. Five to seven venous channels, some of them very large, originate from the primitive torcular area as well as from the medial portion of both transverse sinuses. They stream toward the already markedly developed prominent marginal sinus around the foramen magnum. Some channels may, however, be connected to the distal portion of the sigmoid sinuses. They decrease in caliber and in number by diminution and fusion. By the time the fetus reaches the sixth and seventh month, only a few prominent occipital sinuses can be recognized. The transient enlargement followed by the diminution in number and size of the occipital sinuses similarly is related to the physiological hemodynamic response to the increased venous drainage from the intracranial to the extracranial spaces (12). In 10% of the cases, occipital sinuses were shown on MR venograms obtained from 100 patients ranging in age from 9 days to 83 years (13). Other authors have reported the presence of occipital sinuses in 35.5% of cases (14), but the age group was not mentioned. Ruíz et al (15) reported the presence of occipital sinus in one of 12 cadavers with an average age at time of death of 85 years. In our study, occipital sinuses were present in nine (18%) of 50 patients, predominantly in those younger than 2 years, and they were not seen in children older than 9 years. The occipital sinuses have been found to be relatively wider in neonates than in adults (14). Although we have not found any correlation between the size of the occipital sinuses and age, the age range in which the occipital sinuses were present in this study was relatively small. The internal and external vertebral venous plexus have been shown to be the major drainage of the brain in the erect position, and that outflow through the internal jugular veins is absent or negligible in the erect posture (16–20). It is possible that as the child learns to walk in the upright posture, the increased venous drainage to the vertebral venous plexus and the diminution of flow into the internal jugular vein may account for the diminution in the size and number of the occipital sinuses in older children and adults. In those cases with occipital sinuses, six of nine patients have absent or hypoplastic transverse sinuses. One of those with occipital sinuses has absence of both transverse sinuses, but there is no hydrocephalus, tonsillar herniation, or posterior fossa anomaly. Dora and Zileli (21) found that the presence of occipital sinus is related to the size of the lateral sinus. In this review, we foundthe size of the transverse sinus to be more closely related to the presence of occipital sinus than the sigmoid sinus. It functions as the main drainage canal when the lateral sinus is rudimentary (21). For 41 (82%) of 50 patients, no occipital sinus was visualized. It is possible that the occipital sinuses are atretic or, alternatively, they could be present but collapsed and flow within the occipital sinuses so slowly as to be undetectable by 2D time-of-flight techniques. Further studies with the use of contrast-enhanced MR venography may help detect the presence of occipital sinuses. We reviewed the cerebral venous anatomy in children by using MR venography. It is important to recognize the variations of venous anatomy and not mistake them for pathologic abnormalities. We also reviewed the literature on the development of the venous structure. This provides the background for further MR venography study of the venous system in malformations of the brain. Accepted after revision February 4, 2004.